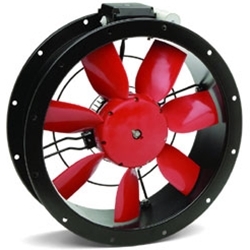 The S&P COMPACT DUCT AXIAL FANS feature, as the name suggests, an extremely compact design created by the combination of an external rotor motor matched with a direct drive wrap around an impeller hub. This very low profile design optimizes airflow performance while minimizing noise generation. Designed to be installed in-line with inducted or partially ducted ventilation systems for exhaust or supply air applications, All S&P Compact Duct Axial Fans feature cylindrical flanged casings manufactured from a high grade rolled galvanized steel plate. The motor and impeller assembly are firmly supported within the casing by a strong steel support frame. 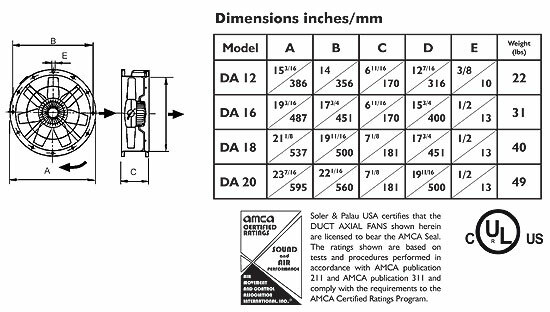 All models are supplied with a pre-wired junction box located on the outside of the fan casing for easy wiring access. This terminal box protects all wiring connections against the ingress of dust and moisture. The entire assembly is protected by a two stage primer and a tough corrosion and UV resistant polyester paint finish. Warranty - Five (5) year limited warranty. All models include asynchronous induction capacitor run and start motors. Constructed from die cast aluminum and finished in a black polyester paint coating. Suitable working temperatures -40°C (-40°F) up to 60°C (140°F). All models include a Safety Auto Reset Thermal Overload Protection. Manufactured from high impact grade aluminum. Manufactured from glass filled UV resistant polyamide. Special Order: Die cast aluminum. Please inquire.